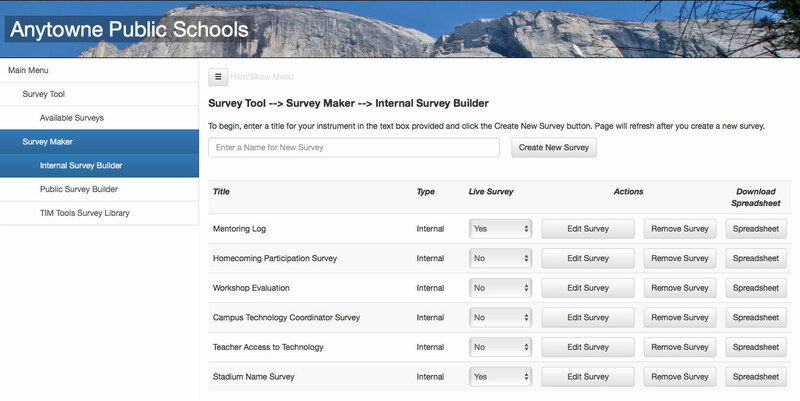 The Survey Tool was added to the TIM Tools suite in response to client requests for a quick method of creating forms, surveys, and reports within a school or district’s TIM Tools instance. As with the other tools in the TIM Tools suite, the site header carries the school or district branding. 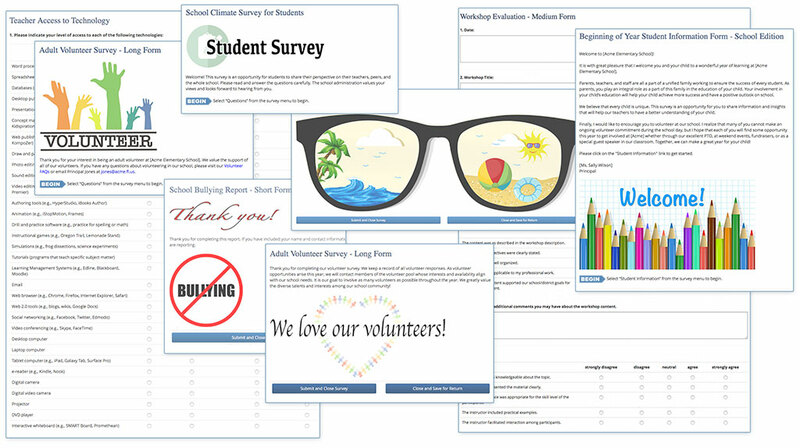 Clients can now create surveys to share with teachers, administrators, observers, or the general public. Surveys can be built from scratch or users can start with a survey from the included library of sample surveys. Surveys built with the Survey Tool are intended to supplement, not replace, the Technology Uses and Perceptions Survey (TUPS). Figure 1. 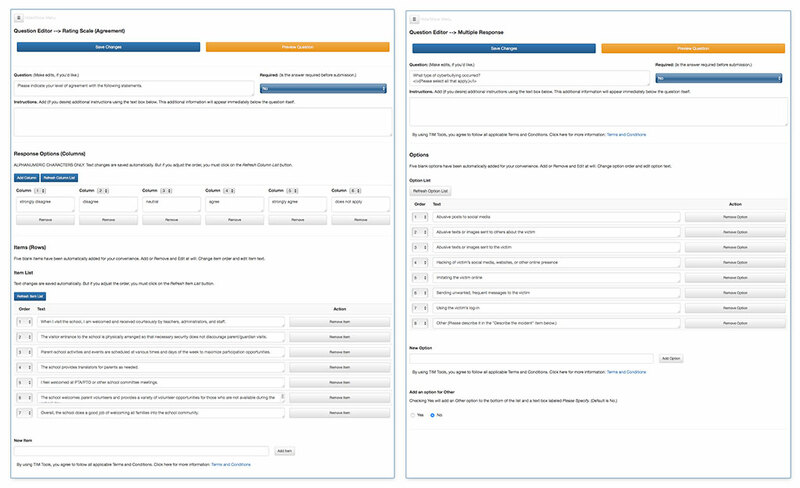 The Internal Survey Builder menu showing existing internal surveys and the box to enter the title of a new survey. TIM site administrators have access to the Survey Maker where they can start a new survey or continue editing an old survey. For data integrity purposes, once a survey is made live and has collected at least one response, it can no longer be edited. It can, however, be cloned and the clone edited if further modifications are desired. A setting for each survey allows participation to be restricted to TIM Tools members only or opened to the general public. Participation in member surveys can further be targeted by role: administrators only, administrators and observers only, or all members. Surveys intended for the general public can be made available to anyone or only to those participants with an access code. Currently, the Survey Tool allows for five question types: free text response, multiple choice, multiple response, agreement scale, and frequency scale. Future versions of the Survey Tool may include additional question types depending on feedback. Each question type is very flexible. Additional information can be added to any question. Each question can be designated as required or not required, multiple choice and multiple response questions support any number of response options, and the number and labels for both scale questions are completely customizable. Figure 2. Interface for construction questions: Agreement scale (left) and multiple response (right). A sixth item type, descriptive text, isn’t an actual question. It’s a means to inject titles, headings, additional directions, charts, or images into the flow of questions at any point. Survey creators have access to a special collection of graphics we’ve created for use in their surveys. Figure 3. Samples from the collection of graphics for use in the Survey Tool. Each survey automatically includes an introduction and closing page with completely customizable text and images if desired. Survey results are downloadable in a spreadsheet format that includes the respondent’s ID if a TIM Tools member and a participant’s IP address if a member of the general public so multiple responses can be filtered. Each submission is also time and date stamped. Included with the Survey Tool is a starter library of surveys available for immediate use or for customization. The library includes survey types frequently utilized by districts including: bullying, volunteers, school climate, home technology, and workshop evaluation. Adult Volunteer Survey: Use this form to solicit volunteers in a school or district. The survey is available in long and short forms. Beginning of Year Student Information Form: This form allows parents to provide information about their child directly to the child’s teacher(s). Campus Technology Coordinator Survey: This survey collects information about the technology resources at each school in a district. The survey is available in both long and short forms. Cyberbullying Report: This form is for reporting cyberbullying only. For reporting incidents of other types of bullying or incidents that combine cyberbullying with other other types, use one of the other available report forms. End-of-Year Technology Checklist: Classroom technology checklist to be completed by teachers before summer vacation. Family-School Partnership Survey: This survey allows parents and guardians to provide feedback regarding our family-school partnership. Home Technology Survey: This survey provides important information to a school or district about the level of technology access in their students’ homes. The survey is available in both long and short forms. Mentoring Log: Observers can use this form to record mentoring sessions. Scheduling Poll by Hour: Use this quick poll to find best days/times for meetings, calls, and other events. Scheduling Poll by Period: Use this quick poll to find best days/periods for meetings, calls, and other events. School Bullying Report : Use this form to report incidents of physical, verbal, social, or cyberbullying at our school, on school transportation, or at school events regardless of location. The survey is available in long, medium, and short forms. School Climate Survey for Students: This short survey gives students the opportunity to share their feelings about their teachers, peers, and the school as a whole. Teacher Access to Technology: This survey allows teachers to report access to technology in their classrooms. Technology Integration Supports & Challenges: This short survey for teachers identifies the supports and challenges they face when integrating technology into their instruction. Workshop Evaluation: Participants may use this form to evaluate a workshop or other PD session they participated in. The survey is available in short, medium, and long forms. Figure 4. Sample pages from surveys included in the Survey Library. The Survey Tool, TUPS, TIM-O, and ARTI are all managed from a central Admin Center. Subscription rates for the TIM Tools suite include the Survey Tool as well as the TUPS, TIM-O, and ARTI. Please contact FCIT at TIM@fcit.us or call 813-974-1640. We are happy to answer any questions you have or to schedule a time to discuss how the Survey Tool can assist your school or district as a part of the TIM Tools suite. Additional information about the Survey Tool can be found on the Survey Tool FAQ section.